On Jan. 7, the unexpected, devastating terrorist attack on the offices of French newspaper Charlie Hebdo transfixed the world. Two gun-toting brothers named Chérif and Saïd Kouachi, operating on behalf of al Qaeda, descended on the building and opened fire. They ultimately killed 12 people, two of them police officers, 10 of them (including slain former editor Stéphane Charbonnier) employees of the struggling French periodical. But now, things are turning around: Charlie Hebdo returned for its first regular issue Wednesday, and more people will be reading than ever before. It's also important to note, as it's easy to lose sight of in all the coverage of the Hebdo attacks — it wasn't just their offices that were struck that day. In a related attack, an armed Islamic militant named Amedy Coulibaly seized hostages in a kosher market in Paris, and ultimately killed four. It's not the first issue that Charlie Hebdo has released since the shooting took place, to be clear. That distinction goes to their Jan. 14 "survivor's issue," which ran just one week after the attacks. But this will be their return to a regular, weekly publishing schedule. The demand, of course, is much higher now — their international profile has soared to an extent they didn't even approach before. Get this: Charlie Hebdo 's subscriber base jumped over 25 times, from just 8,000 per week to over 200,000 per week following the attacks. In other words, if the goal of the killers was to silence the paper's oft-controversial voice, mission failed. The cover, as pictured above, is a pretty eye-catching bright red. 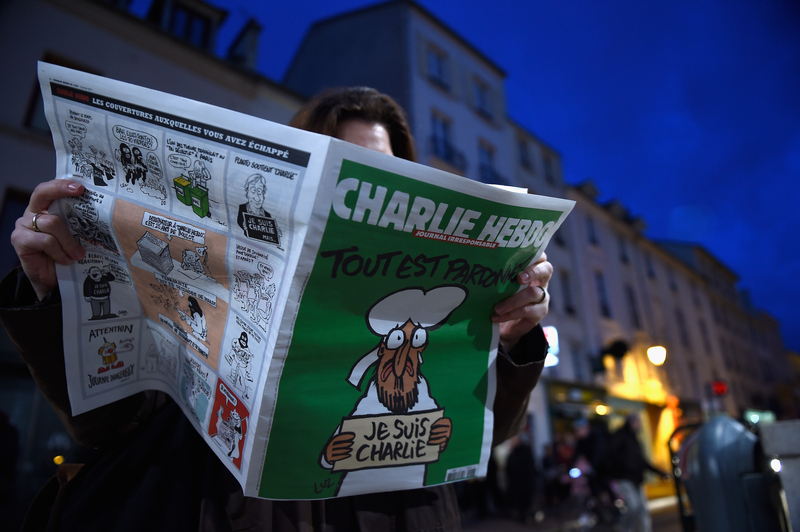 The figures illustrated on the front, in Charlie Hebdo's typical artistic style, strikes a different chord than the survivors' issue did — a cartoon of the Islamic Prophet Muhammad was front-and-center on that one, a defiant and pointed criticism of their censorious killers. By contrast, this one seems less fixated on the grisly attack than on jumping back into the fray. While the cover does include a depiction of an apparent Islamic militant, it also skewers far-right French politician Marine Le Pen (the head of France's right wing Front National, a party founded by her even further-right father), and Nicolas Sarkozy, who hasn't been President of France since 2012. Below the image are the words "C'EST REPARTI," which mean "here we go again" — although French class was long enough ago, I admit, that I didn't know that one on my own. The newspaper was recently on the verge of bankruptcy according to The Guardian, and is now positioned for a massive increase in prominence and readership. It'll be interesting to see what editors end up doing with it, but at the very least, it's inspirational to see Charlie Hebdo rise back up.